The Port McNeill marina features 3000 feet of moorage for visitors (7000 feet overall) and is open year round. The marina offers a range of services for both pleasure and commercial boats including power and water. 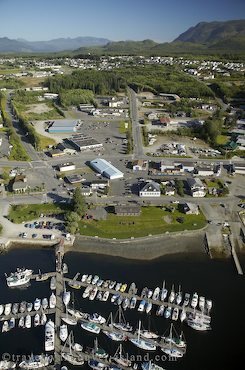 The marina is also situated close to many amenities Port McNeill has to offer such grocery stores, banks, post office, restaurants and cafes, art and gift stores, and the Visitor Information Centre, and various accommodations. Other services include marine shop, engineering businesses, and an electronics shop. With the vast range of amenities, Port McNeill is a popular stop over for many boaters en-route to Alaska or those cruising the waters of the Broughton Archipelago, Johnstone Strait, or the Inside Passage. The waters fringing Port McNeill teem with life making it one of the best places in Canada to see orca whales, Pacific white sided dolphins, humpback whales, Stellers sea lions, minke whales, porpoises, and seals. Port McNeill waterfront and shopping centre, Northern Vancouver Island, British Columbia, Canada.